Restriction: Publishing or otherwise distributing OSAC-derived information in a manner inconsistent with this policy may result in the discontinuation of OSAC support. ISIL has been accused of using chemical weapons previously by forces on the ground. On August 21, ISIL reportedly used mustard agent in a mortar attack in Aleppo province, Syria, where victims reportedly suffered respiratory problems and developed blisters. Confirmation of mustard-gas exposure is pending. In June, ISIL is suspected of having used mustard agent against Syrian Kurdish People’s Protection Units (YPG) forces in Hassakeh. ISIL has also reportedly used chlorine gas in attacks; although chlorine is not a banned chemical agent, its use as a weapon is prohibited under international law. Kurdish Peshmerga forces claim that a January 23, 2015 ISIL car bomb contained chlorine gas. According to Kurdish authorities, laboratory tests on clothing and soil samples indicated that chlorine had been used as a weapon. Both Syria and Iraq have had chemical-weapons programs, and ISIL controls territory in both countries that overlaps with areas known to have contained chemical-weapons stockpiles. It is unknown where undeclared chemical-weapons stockpiles may exist, and if they are in ISIL strongholds. It also remains unclear when or where ISIL obtained chemical agents. In response to growing international pressure, Syria acceded to the Chemical Weapons Convention in 2013 and agreed to destroy its chemical-weapons cache. Syria declared 23 chemical-weapons sites to the Organization for the Prohibition against Chemical Weapons (OPCW), which coordinated their removal and destruction. The exact locations of these sites have not been made public. The Syrian regime reportedly had some 1,300 metric tons of chemicals, 100 missile warheads (primarily Scud missiles), and roughly 1,100 aerial bombs. The last declared chemical weapons were shipped out of Syria in June 2014 for destruction by the OPCW, but reports in late 2014 and 2015 indicated that the Syrian regime may have failed to report all chemical weapons. In May 2015, OPCW reported that inspectors had found unreported traces of sarin and VX nerve agents at a military research site. 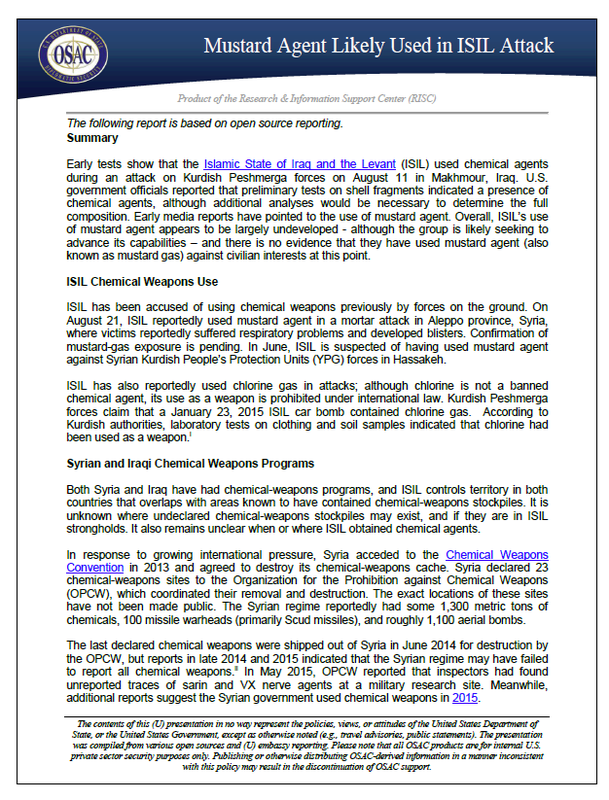 Meanwhile, additional reports suggest the Syrian government used chemical weapons in 2015. Iraq’s chemical-weapons program has been defunct for years, but old stockpiles and facilities have been uncovered recently. Iraq’s chemical-weapons program was developed during the Iran-Iraq war in the 1980s. The majority of the program consisted of mustard agent and sarin; Iraq was reportedly unsuccessful in developing VX nerve gas. Saddam Hussein famously used mustard agent, Tabun, and nerve agent throughout the Iran-Iraq War and during the 1988 Halabja massacre against the Kurdish population. Hussein’s weapons are not necessarily still viable due to significant aging, but they may contain mustard agent or residual sarin. Some chemical weapons discoveries have taken place near areas now under ISIL-control as recent as 2011; the Muthanna State Establishment, now under ISIL control,iii was Iraq’s main chemical-weapons research, development, and production facility. However, the likelihood of ISIL accessing chemical-weapons agents at the Muthanna compound and utilizing them is believed low.